Ever since its world premiere at the Cannes Film Festival, where it won the FIPRESCI Prize and the Vulcan Award for art direction, Lee Chang-dong’s “Burning” (버닝) has continued to gain plaudits and praise. The South Korean entry for Best Foreign Language Film at the 2019 Academy Awards, “Burning” is Lee’s first film in eight years. It is loosely adapted from Haruki Murakami’s short story “Barn Burning,” although less discussed are the film’s references to William Faulkner’s own short story by the same name. “Burning” focuses on three main characters: an adrift failed writer named Jong-su (played by Yoo Ah-in), an unfocused Hae-mi (newcomer Jeon Jong-seo) and the disarming Ben (Korean American actor Steven Yeun, best known for his television work in The Walking Dead). After a chance encounter, Hae-mi tells Jong-su that they were once childhood classmates, guilt tripping him into thinking that he did not give her the time of day while convincing him to look after her cat as she embarks on a trip to Africa. Seduced, he immediately falls hook, line and sinker. The one-word title of the film starts to play out when the three characters meet each other for the first time at the airport following Hae-mi’s return. Jong-su’s ennui transforms into simmering rage, eyeing Hae-mi’s new companion, Ben, as a competitor for her interests and as a member of a social class that Jong-su will never be able to join. This fire, seen in both literal and figurative ways throughout the story, eventually blurs Jong-su’s discernment, resulting in a tug of war between what is real and what is imagined. 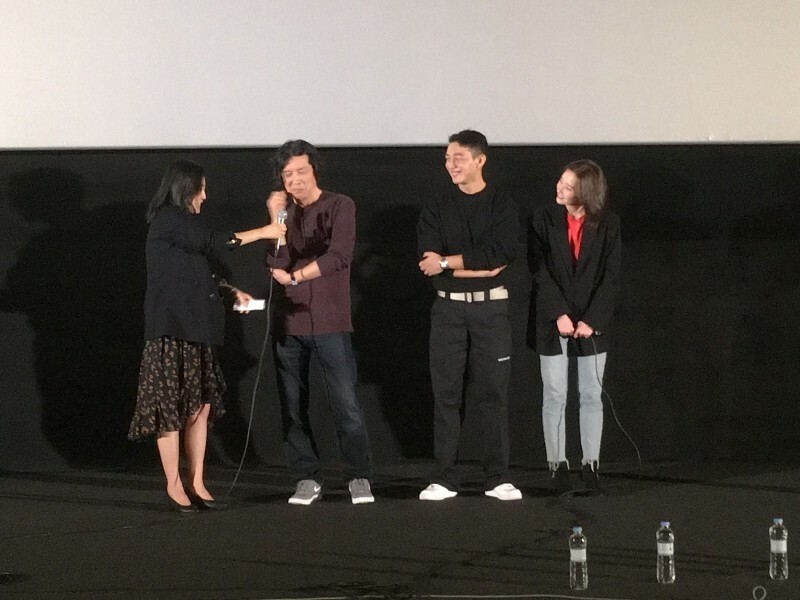 It’s a masterful work by Lee, who along with Yoo and Jeon, recently appeared at a screening of “Burning” at the Busan International Film Festival. These excerpts from their post-screening Q&A session were edited for clarity from the live English onstage translations. Lee Chang-dong: It depicts the rage and loss of a young person, but I wanted to give the audience a new cinematic experience. The genre of this film is a mystery thriller, and usually in mystery and thriller genre films, there are some accidents or events happening, and the audience follows the resolution of those events. But this one, as it was the same in the original [short story] by Murakami Haruki, this man follows accidents and tries to resolve them, but the film ends without a clear resolution. So I wanted to give the audience some mystery…the mystery of life and the world altogether. There is a scene where Jong-su dreams about his younger days, his childhood. Sometimes when you dream at night, we see our younger selves in our dreams…Jong-su is watching the burning of greenhouses and that scene itself can be scary, but at the same time, it could be attractive. So “burning” can be destroying something – so it could be scary – but at the same time, it could have some beauty or charm in it. Lee: Maybe you [say] my previous films are dealing with salvation, but in this film, it was not my intention to deal with salvation as its theme. So rather than deliver the message or theme to the audience, my style is to ask questions to the audience through my films. There are three characters in this film and I think the most serious of them all is Hae-mi because she seeks the meaning of life all the time, continuously. So her trials and her efforts to find the meaning of life may be translated as salvation. Was Hae-mi [the] salvation to Jong-su? Well, I think that could be too easy, but I could say the most serious person was Hae-mi. Although she disappears in the middle of the film, her existence is still there. We don’t know where she is, or if she is really there or not, but I think that is an important point. Yoo: So I had to run because the script told me to. I was kind of running without thinking about the reason why I was running in this film. But maybe the way I ran was, I was running as if to find things in my life. Why am I running so fast to find [them] and what am I seeking, too, by running this fast, and things like that? Jeon: Working with Director Lee was totally unexpected for me. After finishing this film until now, my life has totally changed. What I learned, or what I got, from “Burning” is that I could accept loneliness without too much hassle. So I can accept loneliness as it is now. I think that’s the biggest thing that “Burning” left for me. Yoo: This scenario is like unlike other scripts. It is very specifically depicted, but on the other hand, the world and the people are vaguely depicted. So maybe that’s the view that the writer and the director have on the world and the young people – that’s what I thought. But I could sense that they are caring for the world and caring for the people. So when I started working on this film, I had this mixed feeling of curiosity, expectation and concern about how the world will be depicted in this film and what will happen as I’m filming. Jeon: When I first read the screenplay, the character I played was very much in resemblance to me, so I felt some similarity between me and her. I could not really think deeply about the meaning of the content, but after finishing this film, I feel like I know a little bit. After maybe some more time, and if I watch this film again, I can [derive] some different meaning from this film. “Burning” will screen at the Busan International Film Festival on Oct. 9 and 10 at CGV Centum City at 7 p.m. on both days. It will be released theatrically in the United States on Oct. 26, and has been nominated for numerous awards at two upcoming events in South Korea: the Grand Bell Awards on Oct. 22 and The Seoul Awards on Oct. 27.